In the wake of numerous teen romance movies trying to replicate the success of The Fault In Our Stars, it’s nice to get one every now and then that doesn’t really feature any life-threatening illnesses. However, in the case of Every Day, life is threatened in another, slightly more horrifying way; think of it as the Sunken Place from Get Out if instead of white people placing their souls into the bodies of black people, it was a teen who was involuntarily possessing different teenagers, and instead of it being a smart and subversive horror, it was a teen romance. That’s pretty much what Every Day is, and you’ll either shiver from the horrific undertones of it all, or awkwardly laugh at its bizarreness; either way, it’s a pretty blah teen movie that has one hell of a strange twist. The spiritual being we’re following around has named itself A, who since birth has been possessing people his own age for entire days. We first meet A when it inhabits the body of Justin (Justice Smith), the neglectful and bullish boyfriend of Rhiannon (Angourie Rice), who surprises her by taking her out on a day of love and compassion. The next day, Rhiannon is disappointed that Justin has reverted back to his old ways, but A has taken a shine to her and tries to convince her, whilst in the bodies of several other teenagers, of its condition. Once she believes that A is who it says it is, the real challenge arises in how she can form a relationship with someone who changes appearance, including gender, every twenty-four hours. I’ll admit, it’s an interesting concept that with the right talent involved could be explored a lot more thoroughly, but unfortunately this was made by people who were under strict regulations to make this a teen romance, even when there are times that the premise can become problematic for many of those involved. The character A certainly means well, but you have to consider the overall picture on display here; this spiritual being is unwillingly being placed in the bodies of several different people for a day, effectively killing them (or, perhaps less morbidly, placing them in the Sunken Place), and engaging in a romance with a girl who seems to have no problem with being attracted to, and in one or two cases being physically intimate with, people that in this very moment have no control over their own bodies. When you’re aware of the horrific implications of it all, suddenly it comes across as a lot less charming than it tries to be, and although the film does address this issue upfront it still doesn’t entirely excuse it from taking this premise in such a questionable direction. It’s not as tasteless as something like Everything, Everything which actually did turn into an (unintentional) horror film by the end of it, but it’s still one of the only things worth talking about with this movie, which is otherwise at its heart a generic and forgettable teen romance. Angourie Rice, who previously impressed in her breakout turn as Ryan Gosling’s daughter in The Nice Guys, handles the difficult task of having chemistry with roughly twenty actors as the same character just fine, but she’s largely saddled with actors playing A who all range from either okay to monotonous and bland, and it gives her not that much to bounce off of. It’s one of the few times I actually wished there was a terminal illness in one of these teen romances, because then at least there would be something interesting going on rather than the insane and thoroughly misguided supernatural twist. By the end, you’re pretty unengaged by it all and more concerned about other things in your life than you are this shallow romance, and you’ll be thinking of more entertaining movies like this that you’d rather be watching instead, like The Fault In Our Stars and Paper Towns, both of which are John Green adaptations and subsequently had more interesting things going on in each of them than this movie does. 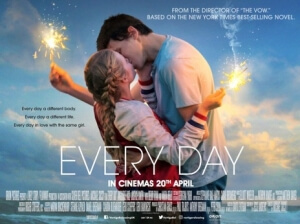 It’s not good enough to recommend seeing in a cinema, nor is it bad enough to say that you should skip it entirely; the premise and how it is executed in this teen romance mould is bafflingly misguided, to a point where I’d almost advise to see it just so you can witness the insanity of it all. Either way, this is just a bland but pretty bonkers attempt to win over the teen crowd without stopping to realise its own mistakes – it’s still way better than Status Update, though. Every Day has a pretty insane supernatural twist that has unintentionally horrific undertones when you really think about it, but that’s really the only stand-out thing to mention about this otherwise bland and forgettable teen romance.